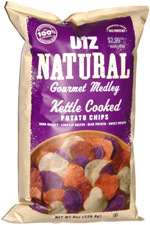 Taste test: This bag included sweet potato chips, russet chips, "blue" (really dark purple) potato chips and lightly salted conventional potato chips, all kettle-cooked. It was a great combination, as all four kinds were crisp and very tasty. You could enjoy these by picking and choosing as you ate, or grabbing a handful with a mix of different kinds. Smell test: Nice sweet veggie chips smell. Similar to the smell of a bag of Terra chips. 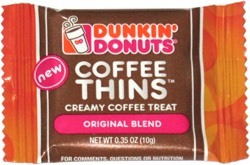 This snack was discovered by Sean Ford at Big Y. Review published .